Good old-fashioned family baseball fun-with a twist!! Our Donkey Baseball Show is 1 1/2 hours of old-fashioned family baseball action the whole family will enjoy! 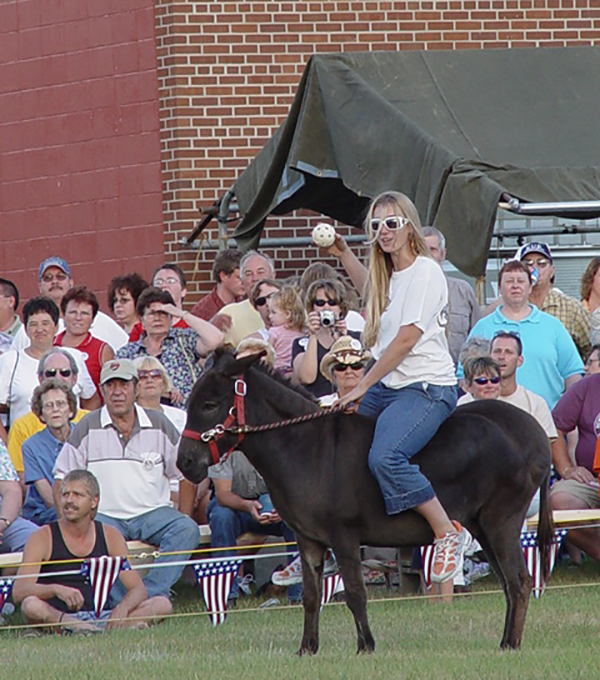 Spectators will enjoy baseball players/donkey riders made up of their family, friends and community members playing in a total of 6 innings of Donkey Baseball! We can play a 2-team or 4-team format with an optional Championship Inning! Our Annual Donkey Baseball Season runs from Memorial Day through Labor Day! We play at festivals, fairs, celebrations and private parties. We work on a flat fee to fit your needs. • ABSOLUTELY NO AFTER SMELL!! Clean-up after our show is just like clean-up after a regular baseball game! • OUR DONKEYS ABSOLUTELY WILL NOT TEAR UP YOUR BASEBALL DIAMOND OR PARK! Suitable Playing Area (such as baseball diamond, rodeo/horse arena, grass or sand preferred), lights if necessary, master of ceremonies, players, 110v outlet for our sound system. Our MANDATORY $125 registration fee is included in the flat fee quote. The registration fee covers our sports accident insurance, $50,000 limit supplemental medical coverage each player.